Blog » February Half Term Whats On Guide! February Half Term Whats On Guide! The big event for half term is Back to Ours, family festival in community venues across Hull. We’ve been to this in previous half term holidays and it’s fantastic, I can’t wait to go this time. There are 2 shows for younger children – The Allotment for ages 0+ and The Giant Jam Sandwich for ages 3+, plus some shows for older children – A Super happy Story About Feeling Super Sad and Delicate Flowers for ages 12+ and Dodgy for ages 14+. Shows are just £3 each and play in various community venues, full details on Mumbler here. Hull Truck Theatre also have a family show on at half term – Slime. A squishy squelchy show for the very young, 19th and 20th February at 11am & 1.30pm. The Deep have an event on across half term and the week after 16th Feb – 3rd March, Plastic Travels, to learn more about plastic in our oceans. Over the bridge near Scunthorpe is Pink Pig Farm, one of my favourite places to take my kids. For half term they have a Superhero week, 15th to 24th February. The Smile Café at The Mile Farmshop in Pocklington are doing pottery painting all week. They also have a nice soft play area in the café if we get a wet and cold day! Art You Experienced are a new messy, arty and crafty company on Whitefriargate in Hull, they have sessions across half term. Some of the country houses have extra activities on across half term – Burton Constable near Skirlaugh and Sewerby Hall near Bridlington have extra events running. Our local nature reserves also have activities – Waters Edge in Barton and Spurn Point both have half term activities. East Riding Libraries are holding Teddy Tales at all of their libraries, a free storytime session where children can bring their teddy in to read too, aimed at ages 3-7 years. There are lots of extra, free activities at Hull Museums, find the full list here. Also at the Hull History Centre their Brick History exhibition runs to 9th March 2019, walk through history in Lego bricks. Down on Humber Street, Hull, there is a pop up studio for Hull Dance. With ‘pay what you can’ sessions on during the week, read all about them on the blog here. Sunflowers Art & Craft Holiday Club – a new quality holiday club at Lund Village Hall starting in February half term 2019. This exciting and fun club offers wonderful, creative art and craft activities for children aged 5-12 years. Sessions on the 20th, 21st and 22nd February, all details on Mumbler here. 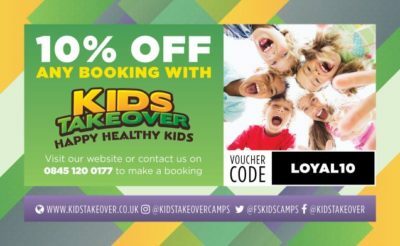 Kids Takeover are running fun activity camps at 3 venues this half term – Hull Collegiate Anlaby, St Mary’s The Academy Hull and Beverley Grammar School. We’ve used these before and my kids enjoy them. Running daily 10.30am-3.30pm (with early drop offs at 8am and late pick ups at 6pm also available). And they have a 10% OFF offer running with Mumbler! Details here. Soccer Kings on Sutton Fields Hull are running football camps daily 10am-3pm daily from 18th to 22nd February, £10 per day or £3 extra to add on the early drop off breakfast club. Also upstairs at Soccer Kings, Cookstars have a school holiday workshop on 18th February, a Pinata Party. I’m taking my kids to try this out! Goldstar Active in Willerby have multi-active camps running daily in half term. Didi Rugby have a half term camp on the 19th February in Pocklington. Goals in Hull also have football camps running daily 10am-3pm, £10 per day. Find full details of all of these and more on the School Holiday Workshops, Clubs & Camps page.